I thought this was the craziest low pass flyby ever, but obviously I was mistaken. After all, what you're seeing here is not a small fighter jet but a B-52 Stratofortress almost kissing the sea while flying by USS Ranger aircraft carrier. Look at the size of that thing and its altitude. That beast is a 265,000-pounds and 185-foot wingspan of a mother—still the backbone of the United States bomber fleet thanks to its amazingly good performance and low cost. 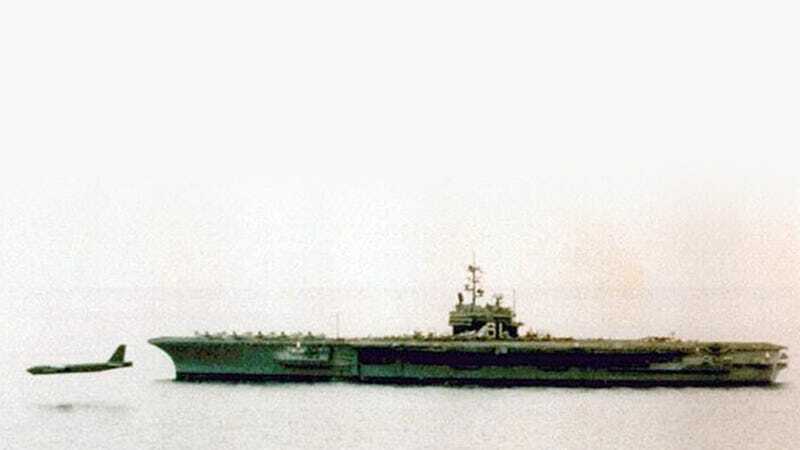 This image was taken in 1990 in the Persian Gulf. US carriers and B-52s were conducting joint exercises when two of the bombers requested permission for a low pass. While it's a high altitude bomber, the B-52s also fly at low altitudes to avoid enemy radar and air defenses. When the B-52s approached the carrier, they announced they were six miles away but the carrier controllers couldn't see them because they weren't looking down.